Rip Curl Pro Portugal 2010 runs at Peniche, Portugal Oct 7th - 18th. Last year Day 3 opened with carnage. The contest site at Supertubos had been broadsided all night by a raging Atlantic and was deemed destroyed at first light by the contest organizers. The “Storm of the Century” is what locals were calling it. Looks like it may happen again. All of the models are agreeing that something big and unusual is brewing out there in the Atlantic, and that it will begin to rear it’s ugly head come Thursday – the first day of the Men and Women’s waiting periods. At this point it’s hard to tell just how tricky it’s going to get, as far as the winds are concerned, but everyone is keeping a close eye on this potentially epic swell development. Adam Melling and Owen Wright are the Le-Ba Storm Riders at the event. Good luck fellahs. 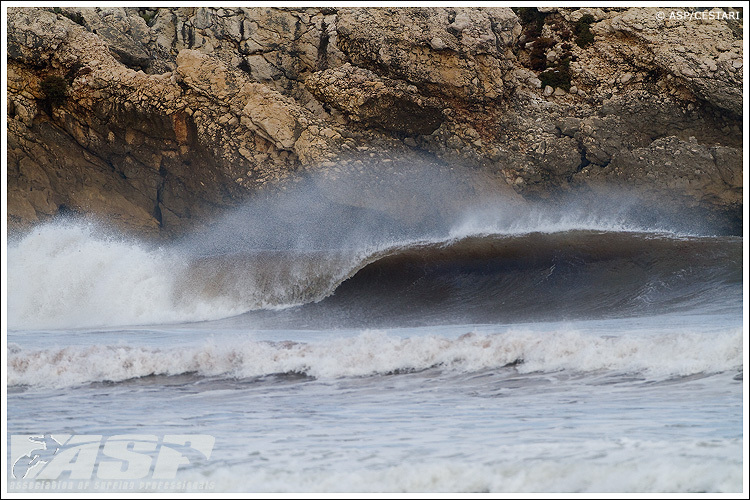 Small surf forced event organizers to call a lay day for the Rip Curl Pro Portugal today. The forecast for tomozza is 20' and breezy. When the event starts Adam surfs in Ht 4 vs Jordy Smith and Gabe Kling. Owen surfs Ht 8 vs Chris Davidson and Roy Powers. Lay day for the men. Magicseaweed are calling for a massive swell system to move into the region in the next 24 hours, with waves up to 20'. The first 9 heats of round 1 ran in 4'-6' stormy conditions at Supertubos. Adam Melling had one good wave but snapped his stick and couldn't find a back up so he moved into round 2. Owen Wright had a solid win and moved straight into round 3. No luck for Mello in round 2 when he was eliminated by 0.29 points by Davo. Owen went one step closer to becoming 2010 Rookie of the Year with a massive heat win , collecting this season’s fourth Perfect 10 for a fins-free turn straight into a full rotation mute grab on his forehand. Amazing ! Owen surfs next in round 4 heat 4 vs Jadson Andre and Jordy Smith.